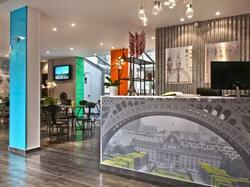 Located in Boulogne-Billancourt, Hotel Alpha Paris Tour Eiffel is 100 metres from Marcel Sembat Metro Station, which leads directly to the Eiffel Tower in Paris. The property offers a garden, a 24-hour front desk and free Wi-Fi. Serviced by a lift, the soundproofed rooms have air conditioning and a TV with satellite channels. A private bathroom with a hairdryer and a bath or shower is provided. A buffet-style breakfast is served every morning at Hotel Alpha Paris Tour Eiffel. In the evenings, guests can enjoy a drink at the bar. This property is a 10-minute walk from the Parc des Princes Stadium and a 15-minute walk from the River Seine. The Longchamp Racecourse is 2 km away. This room offers a Nespresso coffee machine, a king size bed and slippers in the bathroom. Late check out at 14:00 is possible. A box of chocolates or a fruit basket is offered upon arrival. This room offers free Wi-Fi, a TV with satellite channels and a private bathroom with a hairdryer and a bath or shower. An iPod docking station is also available.